Fear of Nuclear – Part 3 | Watts Up With That? However, after both types have been used in a reactor they will contain fission products, many of which are highly radioactive. Spent fuel is known as high-level waste (HLW) and must be handled and disposed of with appropriate care and caution. After a fuel bundle has been removed from a reactor, it will be both thermally and radioactively hot for a considerable period of time. Spent fuel bundles are normally kept submerged in water for several years after removal from the reactor until the radioactivity has died down and much of the short-lived radioactive fission products have decayed. However, there will still remain a number of longer-lived fission products which can remain dangerously radioactive for thousands of years, and for which a long-term solution must be found. The following section is a short primer for those not altogether familiar with the subject of radioactivity. You can skip this if you are familiar with it. Elements, such as carbon or cobalt or uranium, each have a fixed number of protons in their nuclei, but can have different numbers of neutrons. Versions of the same element, differing only in the number of neutrons in their nuclei, are known as isotopes of that element. Some isotopes are unstable and disintegrate spontaneously, giving off alpha, beta and/or gamma rays in the process. (Alpha rays are high energy helium nuclei, beta rays are high energy electrons, and gamma rays are high energy photons.) For example, cobalt has a stable isotope, cobalt-59, with 27 protons and 32 neutrons in its nucleus, but it also has an unstable isotope, cobalt-60, with 33 neutrons. Isotopes will be referred to in this article in both the long form, such as cobalt-60 or uranium-235, and in the short form, such as 60Co or 235U. Unstable atomic nuclei, such as carbon-14 or cobalt-60 or uranium-235, will disintegrate spontaneously at a rate which is specific to that particular isotope. To put it in more mathematical terms, there is a fixed probability that a nucleus of any isotope will undergo radioactive decay in any given period of time. This probability is a constant for any particular isotope but varies from one isotope to another. The level of radioactivity associated with any particular isotope depends on how often decay occurs. The total radiation from a particular sample of that isotope depends on the energy of the particles released during decay, the rate at which decay occurs, and on the sample size, i.e. how many atoms there are available to undergo decay. The half-life of a particular isotope is the time during which 50% of all the nuclei in a particular sample of that isotope will have undergone radioactive decay. Cobalt-60, for example, has a half-life of 5.3 years, so that if a sample of cobalt-60 is produced in a nuclear reactor, typically for medical purposes, then 5.3 years after it is taken out of the reactor one half of all the nuclei in that sample will have decayed. The total radiation from that sample will be correspondingly halved, since with only half as many cobalt-60 nuclei as there were originally, there will be only half as many nuclear disintegrations per second as there were initially. After another 5.3 years, or 10.6 years altogether, the radioactivity level will have dropped to on quarter of its initial value, and to one eighth after 15.9 years, and so on. Isotope half-lives vary enormously from one isotope to another. Hydrogen-7 (one proton and six neutrons) has a half-life of 2.3×10-23 seconds, while tellurium-128 has a half-life of 2.2×1024 years, which is about 160 trillion times the age of the universe. The longer the half-life, the slower the rate at which radioactive decay occurs, and hence the lower the level of radioactivity associated with that isotope. Cobalt-60 has a high radioactivity level because its short half-life means that nuclear disintegrations occur quite rapidly. Uranium-238, in contrast, has a half-life of 4.5 billion years, which is about the age of the Earth. A sample of uranium-238 present when the Earth was first formed would still have half its atoms yet to undergo nuclear disintegration. Cobalt-60 must be handled with extreme care. Uranium-238 can be handled without any radiation-related precautions at all. Almost all civilian nuclear power reactors, i.e. those used to generate electrical energy, use either 235U or 239Pu as a fuel. When either of these two nuclei undergo fission in a reactor, they split into two parts, together with the release of additional neutrons which keep the reaction going, plus energy in the form of heat. The latter, of course, is the whole point of a power reactor. Most fission products are unstable, i.e. they will undergo radioactive decay themselves, and it is these fission products which create the problem in nuclear waste, and for which a long-term disposal method must be sought. In addition to the fission process, both uranium and plutonium atoms can capture neutrons and be converted into transuranic elements, otherwise known as actinides. These too are radioactive and require long-term disposal. The chemistry of fission products and actinides is too complex to be discussed at length here. Interested readers are recommended to consult The Chemistry of Nuclear Fuel Waste Disposal by Donald R. Wiles . It is generally agreed that the best way to deal with high-level waste on a long-term basis is to bury it deep underground. The International Panel on Fissile Materials (IPFM), a group of independent nuclear experts from sixteen countries, has stated that “There is general agreement that placing spent nuclear fuel in repositories hundreds of meters below the surface would be safer than indefinite storage of spent fuel on the surface” . However, numerous objections have been raised to this, which can be summarized as the possibilities of accidental dispersal into the biosphere, and accidental unearthing by our distant descendants. The best way to meet these objections is to look at the currently proposed methods for HLW disposal and see how they meet these objections. Before we do this, some basic parameters need to be established. First, let us be clear about the purpose of long-term burial. No burial method can be guaranteed to keep the buried material isolated for ever, because ever is a very long time indeed. The purpose instead is to keep the waste isolated for long enough that the radiation levels associated with it will have decreased to a level where any harm associated with it is minimal. The decay characteristics for HLW from a natural uranium fuelled CANDU reactor  are show below . Characteristics for other spent fuel types are broadly similar. Although it will take about a million years until the radioactivity level reaches that of natural uranium, it is not necessary to wait this long for the risk to future generations to become negligible. The human race has coexisted with uranium and other radioactive ores for its entire history, and we do not seem to be any the worse for it. A radiation level ten times that of uranium ore is probably acceptable, considering the fact that by the time the buried material will have resurfaced again it will be very much diluted. The time for this to occur is about 43,000 years, and this can be used as a figure of merit when designing a disposal method. Decay characteristics for used natural uranium fuel associated with CANDU reactors. Other reactor fuels will have similar characteristics. Second, no long-term disposal method can rely on administrative measures to keep the material safe, such as a fenced-in area patrolled by guards, because while we can perhaps guarantee the maintenance of such measures for a generation or two, beyond that we cannot possibly foresee whether social conditions will permit them to be continued. Consequently, any long-term burial must be done ultimately on a seal-and-forget basis. Third, the two enemies of long-term burial are water and oxygen. Water is important because, without water, there will be no corrosion and any containers used will not corrode. Oxygen is important because, while UO2 is not water-soluble, the UO4— ion is soluble, thereby providing an easy path for water dispersal. The problem of safe, long-term burial therefore devolves largely to one of keeping out both oxygen and water. Deep burial involves the creation of a geological depository below the level at which atmospheric oxygen can penetrate through solid rock, which is typically 500 metres depth. It is assumed that water can penetrate to this depth, so the burial method must take this into consideration. Burial vaults are designed to have a series of engineered barriers so that if and when one barrier fails, another will come into play. Deep burial methods have been selected for use in a number of countries, including Finland, Sweden, Britain and Canada. A typical multiple-barrier system which is described here has been adopted, but not yet implemented, by Canada . Canadian reactors use natural uranium in the form of uranium dioxide (UO2) pellets, which are assembled into fuel bundles, 0.5m x 0.1m diameter. Fuel bundles spend about 18 months in a working reactor before they are replaced. There are about 2.6 million used fuel bundles in Canada today, and about 90,000 are added each year. The Canadian specifications state that the area chosen for the depository must be geologically stable and must provide a minimum of 50 metres of unfractured rock enclosing the depository. The area chosen must have little likelihood that the surrounding rock would ever be exploited as a mineral resource – no recoverable oil, gas, metals or other useful minerals nearby. (This is one reason why old salt mines are not considered suitable for permanent burial because, although they can reasonably be presumed to be water-free for any foreseeable future, they might be re-opened at some future time for salt mining.) Burial would be 500-1000 metres below ground. 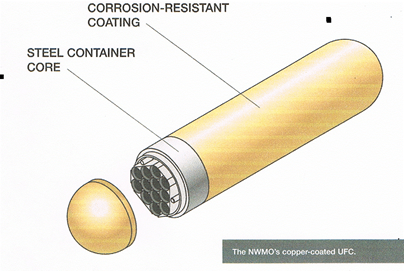 Used fuel bundles will be placed into cylindrical stainless steel containers coated with a 3 mm layer of copper for corrosion resistance. The containers are embedded in bentonite, which is a clay that swells on contact with water, thereby providing a self-sealing, low-permeability barrier. (It is commonly used to line the base of landfills to prevent migration of leachate.) The vault is then sealed with a clay- or cement-based backfill. When all vaults are full, the access tunnels and other holes will be sealed, and the land above returned to a pristine condition . In order for the buried waste to become a problem for future generations, the containers must corrode and their contents must be transported back to the surface where they can enter the biosphere. Calculations on the rate at which this could occur indicate that this would be 50,000 years at a conservative minimum. The maximum level of radioactivity at this point would be less than ten times that of the original uranium ore.
Vitrification can usefully be used in cases where the fuel is reprocessed after use, so that the radioactive fission products can be separated out into a much more compact form than the original fuel bundles. Reprocessing is only useful where enriched fuel (uranium or MOX) is used, in which the spent fuel still has a significant amount fissile material, and so is worth reprocessing to recover it for further use. In the process of recovery the fission products can be separated out and then mixed with molten glass. The resulting glass blocks are very much more corrosion resistant than the original fuel bundles. They can then be permanently disposed of by deep burial in a manner similar to that described above. Although long-term calculations are subject to many variables, the indications are that vitrified HLW would take hundreds of thousands of years before its radioactive burden was released to the biosphere . The US is actively examining a method of burial in which vertical shafts up to 5 km deep and a metre in diameter are bored into the Earth’s surface . Nuclear waste in strong steel containers would be lowered into crystalline rock in the lower 1 to 2 km of the hole, and the remaining 3-4 km would then be steel-lined and filled with layers of sealing materials such as bentonite, asphalt, concrete and crushed rock. Under some variants of this plan, the waste would still be radioactively hot when inserted into the borehole, and the heat produced would melt the surrounding rock. When it cooled after a period of years, the waste would be completely entombed in the rock. Lest anyone should think in terms of an underground nuclear explosion as a result, the geometries involved make this quite impossible. One problem with this scheme is that current technology only permits boreholes of less than 50 cm diameter to be bored to this depth, so nuclear waste would have to be repacked before it could be inserted. However, it is a reasonable expectation that, were this method to be fully implemented, the required one-metre boring technology could be developed. An advantage of this method of disposal is that it would be very sparing in land use. It is estimated that the entire US nuclear waste stockpile would require no more than 800 boreholes, which could be situated on an area of no more than a few square kilometres. Filled and capped boreholes could be covered over and the land returned to a pristine condition. The physical properties required of a permanent disposal site are well-defined, and such sites can reasonably easily be located. The social properties can be more problematic. Any site selected must be acceptable to the local inhabitants, acceptable to nearby communities, and acceptable to the wider public. It is an undeniable fact that there is a deep-seated fear of nuclear energy in our society. Part of this presumably stems from the use of nuclear weapons in World War II and their continuing deployment to this day. However, part of it must be ascribed to what can only be described as hysterical overreaction by journalists and public intellectuals to any nuclear-related accident. Isaac Asimov, a normally level-headed science fiction writer, based some of his books around a future uninhabitable, intensely radioactive Earth arising from the Three Mile Island accident (which actually hurt no-one and released only miniscule amounts of radiation ). The claim by some public intellectuals after Fukushima that the whole western seaboard of North America would have to be evacuated arose from the same fount of baseless hysteria. Nonetheless, any attempt to impose a nuclear waste disposal facility on a particular location by government fiat is going to meet with resistance from local inhabitants unless the concept is explained very carefully in advance. The first attempt by the US to drill an experimental deep borehole, in Pierce County, North Dakota, failed when local officials first heard of the project through the media , which may well be described as a textbook example of how not to get the local populace on your side. Disposal sites are most likely to be located in remote, sparsely populated areas where employment opportunities are few and far between. Any disposal site, once opened, is likely to stay in operation for many years before it is finally sealed off, thereby providing well-paid employment for local people. This, together with a completely honest and open description of what the disposal facility is and is designed to do, has a much better chance of getting approval from the local population. High-level nuclear waste is a problem but not an insoluble one. Our ancestors have had other problems disposing of toxic waste in the past, and have come up with solutions for it. One advantage of HLW is that it will gradually become less dangerous as time goes by, unlike, say, arsenic waste from mining which will remain toxic no matter how old it is. A properly designed nuclear disposal facility will be capable of isolating high-level waste until it is no longer a threat. My thanks go to Don Wiles, emeritus professor of radiochemistry at Carleton University, Ottawa, Canada for some of the material used here and for his much appreciated advice and comments. Roger Graves is a physicist and risk management specialist who, much to his chagrin, is not associated with big nuclear, big oil, or big anything else. Is Yucca Mtn, Nevada still an option? Of course it is, now that Harry Reid is gone. It was the perfect site, it still is, but the Casino industry paid Harry Reid to block it. I know it gets tiresome to say everything is political, but today it is. No getting around that. If Nevada wises up and picks a GOP Senator in 2018, then it will probably continue to be off limits. But if they continue on their all-dem lets be California kick, then sure, why won’t Trump and Co. open it up? Best place for a nuclear waste dump is always gonna be in your political enemies back yard. You are forgetting another option favoured by Margaret Thatcher: dumping it into the Irish Sea. This may be stupid, but I have always wondered about drilling near subduction zones; say off the California coast. Wouldn’t that work? Drill deep, and then, in time, it’s melted deep into the earth. Yes. Trump’s budget proposes about $100M to restart the licensing process. Minor nit-pick. The NRC process had been restarted per court order. King Obama and Prince Reid had been told to follow the law or change it. All other American would be arrested for disregarding environmental laws. Not discussed in this article is the current method used for high-level wastes from nuclear power plants. That is, storing the spent fuel onsite in above ground tanks of water. Ask yourself, which is more dangerous underground storage at Yucca Mountain or onsite storage, with many of the onsite storage areas close to large urban areas. Both are extremely safe options. Statistically, there is very little change in risk of onsite storage for long periods of time. It’s not “dangerous” to store spent fuel in water-filled pools at reactor sites. As long as all the proper administrative controls are exercised, it’s very safe. But that is “storage” not “disposal”. As the author pointed out, for purposes of “disposal” the timeframe in which the wastes will eventually be rendered safe for exposure to humans is on the order of several tens of thousands of years. Nobody can predict what controls, if any, will be exercised tens of thousands of years out, given that all of human civilization is less than about 5-6,000 years or so old. Safe disposal is not difficult technically speaking … the hard part is the politics. We burn only about 1% of the fuel in a standard LWR, burying it is a crime. We should have stopped using 60s technology a long time ago, say around 1965 (when molten salt reactors could have been commercialized). Either an MSR or Integral Fast Reactor like PRISM could be used to burn all the fuel and most of the waste. 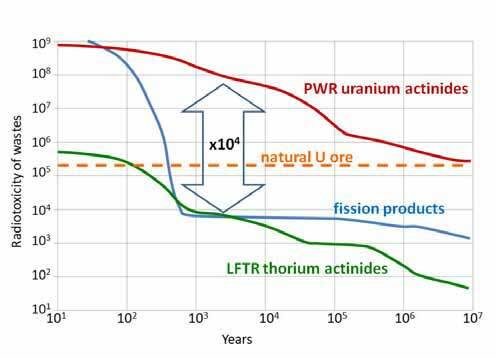 Compare what the decay rates are for standard PWR / MOX reactors versus LFTR (thorium). If all of this is true then, why are we using old reactor technology? This is where all of that grant money used to fund phony climate research should have been spent. You can verify beyond any reasonable doubt that this article is not the full two bob and non authoritative because only the disposing of the end product is mentioned…….By far the most overlooked aspect of the nuclear propaganda is to neglect the trillions of tons of low level, but none the less ultra toxic tailings sludge and the chemicals and heavy metals that are mobilised and stored in open air dams that are mythically designed to last for ever… Dream on…….. This refining process of getting the fissionable material from the ore be it Thorium this site now promotes or MOX etc is extremely toxic and cumulative. There’s much about your post which indicates that you’re on an agenda- driven rant, but the line about “…Thorium this site now promotes…” removes any doubt. I have that same question about the current NASA and the private space programs. It is like watching the 50’s and 60’s all over again. No, unfortunately, this is a typical reaction to nuclear debates in Australia and by Australians after decades of scare/fear stories in the Australian media. Thanks Alan…i would call It a harmless benign ‘focus’ on what is missing from most of the deliberation here today, and that is the ‘back end’ of the nuclear waste cycle….it does actually have a back end and concentrating on the front end beyond the nuclear fuel and what happens when it is used does not mean the open air tailings dumps mythically designed to last forever and the millions/billions/? of drums of chemical waste magically disappears because there is an article that talks about the front end the nuclear waste cycle. Thorium is not exempt from ‘back end’ chemical processing and associated waste, heavy metals leeching etc….the somewhat overcooked area concerning radioisotopes are already somewhat covered here with the focus on the finished product and its derivatives like spent fuel . ………however! !…….for every kilo of finished nuclear fuel, perhaps thousands of tons of all kinds of chemical waste and the associated storage dilemma which is ongoing and cumulative is also present……I myself have no idea how much chemical waste produced by by the nuclear industry ends up in mother ocean……do you?? Does anyone here?? Links !! The track record of the nuclear industry is an abyss of toxic waste and disaster (My opinion) so to provide some balance a calm look at the back end (Without becoming offended) associated with the production of the modern nuclear wardrobe and effects is obviously needed also. There are many examples of tailings dams disasters on a fairly regular basis and other nuclear chemical oops we spilled it moments associated with nuclear chemical waste… for example Hanford as just a minuscule example…Tailings dams never go away, they just get bigger and thorium does not process itself by simply adding thorium…..intensive toxic chemical processes are undertaken and we would all know by now if the by-product of thorium enrichment was fertiliser to grow salmon food. “On June 25, 1988, the Hanford site was divided into four areas and proposed for inclusion on the National Priorities List. On May 15, 1989, the Washington Department of Ecology, the United States Environmental Protection Agency, and the Department of Energy entered into the Tri-Party Agreement, which provides a legal framework for environmental remediation at Hanford. As of 2014 the agencies are engaged in the world’s largest environmental cleanup, with many challenges to be resolved in the face of overlapping technical, political, regulatory, and cultural interests. The cleanup effort is focused on three outcomes: restoring the Columbia River corridor for other uses, converting the central plateau to long-term waste treatment and storage, and preparing for the future. The cleanup effort is managed by the Department of Energy under the oversight of the two regulatory agencies. A citizen-led Hanford Advisory Board provides recommendations from community stakeholders, including local and state governments, regional environmental organizations, business interests, and Native American tribes. Citing the 2014 Hanford Lifecycle Scope Schedule and Cost report, the 2014 estimated cost of the remaining Hanford clean up is $113.6 billion – more than $3 billion per year for the next six years, with a lower cost projection of approximately $2 billion per year until 2046. About 11,000 workers are on site to consolidate, clean up, and mitigate waste, contaminated buildings, and contaminated soil. Originally scheduled to be complete within thirty years, the cleanup was less than half finished by 2008. Of the four areas that were formally listed as Superfund sites on October 4, 1989, only one has been removed from the list following cleanup. While major releases of radioactive material ended with the reactor shutdown in the 1970s and many of the most dangerous wastes are contained, there are continued concerns about contaminated groundwater headed toward the Columbia River and about workers’ health and safety. Right now, NASA are trying to rebuild the Saturn V, but at 10x the cost. SpaceX are trying to build something 10x the size of the Saturn V at a fraction of the cost. As for old reactor technology, we continue to use it because governments have done everything in their power to ensure there’s no profit in new reactor technologies. High-level waste cannot be used as fuel. Fast breeder reactors can run on depleted uranium and plutonium though. They would burn more of the fuel, so you’d only end up with fission products (and not a mix of fission products/trans-uranium elements/depleted uranium that the modern reactors produce). That means less waste by mass, but not by radioactivity. bombard high level waste with neutrons and it tends to speed up the fission. Fission of heavy elements releases energy, so any heavy element even non radioactive ones are potential fuels. Although its a very poor yield . WE haven’t even scratched the surface of most nuclear chemistry, largely because of public fear. Another point the article doesn’t make clear is that if its long lived, it inst very radioactive. Like Uranium 238. Or in fact plutonium, which can safely be handled. The nasty stuff is in the 100-10,000 year half life. AS far as chucking it in the sea goes, well there’s 4 billion tonnes of uranium there already. If it stays at the bottom its a very very safe place for it to be. High Level Wastes (HLW) have been vitrified at the Savannah River Site for almost 20 years. Over 5,000 canisters ( 2 ft diameter.x 10ft.long) of the borosilicate glass are stored on site awaiting a permanent repository. These HLWs are from processing fuel and target elements to make Pu-239 and tritium for the US weapons program. I would disagree with this. I posted this link below but added here as well. High-level waste can be used as fuel and not only by the methods discussed in the article linked to below. As you said this does need a fast spectrum reactor like the Lead cooled one mentioned by ptolem2 below or the sodium cooled as described in the article linked to. If you want considerably more detail on this, you can take a look at this ‘heavy duty’ book on Amazon. There is a full color version, which is expensive, and non-color version for about US$15. It deals with the subject above, as well as providing details of the various nuclear reactor cycles. Amazon lets you take a look ‘inside’ the book. Shoot the stuff out to the sun! That’s a really bad idea. It would require thousands of launches just to take care of the current stockpile. No matter how careful you are, there will be a few launch failures (translation: rockets exploding) along the way, with each of them releasing radioactive materials into the biosphere. That is a good idea. The vitrified waste could be transported by ship to a remote ocean isle. A large aircraft could carry rockets loaded with fuel as high as possible and then shoot the rockets into space where they jettison their loads and fly back to the island. You really don’t know much about rockets or orbital mechanics, do you? Any rocket with enough thrust to enable it to leave Earth orbit, let alone produce enough delta-v to “drop into the sun” would be too large to be carried by any known aircraft. We are talking Atlas V or Falcon Heavy sized rockets here. No, this a very, very bad idea. Most of the difficulty is artificial, produced by the policy introduced by the Jimmy Carter administration in the US of banning reprocessing. Like many of the policies advanced by Carter, it was manifestly badly thought out. Carter adopted the notion that reprocessing was a proliferation risk on nuclear weapons, and the US “setting a good example” by not reprocessing would somehow dissuade foreign governments from making nuclear weapons. The notion that spent fuel must be sequestered for some 43000 years is a silly requirement, like much of Carter’s policies in general. As far as I know, no country has ever used power reactor fuel to make a bomb. Counterpunch is not quite reliable, and Pakistan and India apparently ran the reactors as “research”–i.e. plutonium production reactors, not power reactors. The US, the Soviets, and many other countries used plutonium for bombs, but my casual understanding is that as there are two major isotopes, Pl239 and Pl240, only the first of which is desirable in a bomb, and management of the reactor very much alters the ratio between the two. I think the U.S. did it (1963 or so), and did so purely as a demonstration it could be done. Spent first cycle fuel goes through the Purex process to separate the plutonium from other elements, but no further processing, which is more difficult, to separate plutonium isotopes. The problem with using this plutonium as bomb material is that the Pu240 has such a high rate of spontaneous fission that it will likely cause a premature chain reaction. The 1963 tests were to demonstrate that very rapid assembly of a critical mass has a reasonable probability of making a bomb. The technology of critical mass assembly used at Trinity results in about a 1/3 probability of a bomb (p=2/3 of premature explosion). Power reactor fuel for bombs has the same sort of problem as using Thorium as fertile material in a research reactor, in that the resulting bomb is quite unreliable, and anyone with the wherewithal to produce a bomb has used dedicated plutonium producing reactors or isotope separation preferably. What happens when you elect a peanut-brained liberal to a position of authority. Just sayin’. I am horribly ashamed I voted for bubba. I also regret voting for Carter but he was a very nice idiot. I do not want nice for POTUS. Plutonium is Pu. 239 is indeed the fissile isotope for bombs with a high cross-section of absorption of thermal neutrons (like 235 U). The graphite moderated U reactors like the Soviet RBMKs and also Winscale in the UK were were most efficient at producing plutonium. If we met at a social function, I would SO pick your brain,….. Thanks for the article Roger. Are you in favor or opposed to breeder reactors like the BN-800 as a disposal mechanism? It seems to me that’s a lot of energy to bury when it could be used with some patience and persistence? The reactor core is, in size and mechanical properties, very similar to the BN-600 reactor core, but the fuel composition is very different. While BN-600 uses medium-enriched uranium dioxide, the new plant will burn mixed uranium-plutonium fuel, helping to reduce the weapon-grade plutonium stockpile and provide information about the functioning of the closed uranium-plutonium fuel cycle. It was highlighted that the closed cycle will not require plutonium separation or other chemical processing. Although breeder reactors, if properly configured, can produce 239Pu and burn it, the radioactivity problem over fission products does not go away. The same is true for 233U reactors that breed fissile thorium. Fission products do not undergo fission. Further, if their concentration becomes too high in the reactor, they absorb most of the fission neutrons, and the chain reaction process stops. This occurred with the very first reactor under Fermi at Univ. Chicago. So at some point, fission products and unused fuel must be removed and either stored or re-processed. B.T.W. About 1.7 billion years ago at Oklo Gabon, Africa, the natural concentration of uranium and organic carbon to act as a moderator became optimal and Nature produced a natural reactor. It persisted for some time cycling on and off. Some of the fission products remain. Doesn’t go away, but the half life of the fissile products is much improved over plutonium or uranium isotopes which are effectively forever (correct me if I’m wrong). Yes, I agree a very good article. This has great potential…solid waste encapsulation in the form of a synthetic rock (better than borosilicate glass) as the primary containment. This is then encased in high quality steel containers as a secondary barrier. These are then placed in very deep boreholes as a third barrier. The best bit, however is that the metallic canisters are surrounded by carbonaceous shale or its equivalent…any leaching Uranium is instantly trapped and moves no further…a naturally stable very deeply buried uranium orebody would be formed instead of the waste escaping to the surface. Here nuclear reactor waste was safely contained by gold old Mother Earth for billions of years with no help at all from us. Isn’t nature wonderful! The article is not even half baked in my opinion because it does not include the disposal of chemical waste during processing and huge open air storage of tailings/etc/etc……..the nuclear industry is chemically toxic enough as it is and the end product is NOT the only disposal problem….. Obsession with the end product and its disposal is a serious oversight. Very serious indeed..
To add my two cents’ worth…. In early 1980’s I was a Jr. Civil Engineer working on the Main foundations Contract for Fidler’s [sic!!!] Ferry Power Station on Merseyside, Lancs. When the wind was blowing in the right.. [for which read WRONG!!!] direction we got the blow-over from the Runcorn Chemical Waste tips, some 10 km downstream to the W.. I was reduced many times to a state of noxiousness from the stink alone and rendered incapable of work. I invite others to complement my experience of noxious Chemical Waste Tips….. surely, I can’t be alone. The neighbouring town Widnes, had the appelation of ‘Bronchitis Capital of G.B.’, and I can personally attest to it. I too wd compare the damage done to the human body by — on the one hand — disposal of nuclear fuel rods as suggested, with far more egregious … certified, permitted, allowable … chemical waste disposal willy-nilly in piles creting toxix down-wind plumes of noxious vapours. HALLLLLOOOO RESIDENTS OF RUNCORN, WIDNES, PENKETH, BOLD & WARRINGTON???? To say nothing of the townships in Cheshire that lay to the S. of the Mersey River. Tailings are a big problem with all earth moving. From building ballasts large enough to hold wind generators to copper mined for electronics, exposure can mobilize chemicals. Even farming has its impact on surface waters. But as the article indicates, there are vectors such as water or oxygen that make pathways into the environment. In terms of tons, I dare say cement production, and battery and electronics production beat the nuclear industry. Open air storage may actually help in terms of forming insoluable materials. The vector has to be accessed according to the chemical properties of the exposing agents and the material itself, plus chemicals generated. Simply recognizing that tailings can be a problem does not mean it makes any particular industry a top toxic. One that should get your attention is our road systems: removal of overburden, blasting, rainwater runoff, the materials of construction, etc., AND they are just left lying there in the rain and air. Not adding sarcasm tags, simply because it is true. A number of 4th generation fission comcepts significantly reduce the HLW problem. These merit engineering and prototyping. Isnt happening because of current economics and regulatory policy. That should be changed. +1. This article illustrates that waste from the conventional fission rectors is enough of a headache to warrant exploration of alternative nuclear fuels and reactor designs. If I understand it correctly, fission of thorium (or to be exact, U233) produces a lot less transurane waste than that of U235 and Pu239, and there is also a lot more thorium to be found than uranium. The so-called thorium reactors do not produce long-lived trans-uranics, as 235U produces 239Pu, but they do still produce fission products that must be dealt with. First, it is a political problem. Governments created an anti-nuclear hysteria. Spent fuel reprocessing explicitly forbidden. We shoot “depleted uranium” shells at enemies; we should extract the enormous energy the depleted uranium still contains. Second, the political problem created a technical problem. We know – theoretically – what to do, but no design and testing can be done. What about encasing the waste in glass and disposing of it at the subduction interface at the bottom of the Marianas trench? He objects to every proposal. It’s actually a very good idea to propel it into a subduction zone. After posting exactly the same suggestion, I just noticed your comment after reading through, except I described it as a crackpot idea. My apology on the both accounts. Shooting/drilling it deep into the seafloor muds there stops any potential harm (real or perceived) to the little fishies. The Greenies will object of course but it safely locks it up till it’s pretty much decayed away. Only problem is that it needs an ideal world to work..ie. one without the green loonies! Surely it’s the ultimate in recycling (done by subduction and then volcanoes). All natural processes one would have thought. And its a quite old idea. My understanding is that in such locations, the sedimentation rate removes the material from our concern in a handful of years. The glassification process seems a good way to fabricate the trash cans. To get it ground to pieces at tectonic boundaries or is the trench not at a tectonic interface? It is a good idea but hard to get past the greenies who can’t stand anything being put into the sea. They don’t understand dilution, background radiation, and the presence of the vast quantity of U already dissolved there. Back in the 1970’s New Scientist magazine had a good article on this option and they concluded it was quite safe, even just dumped in a deep trench with no encapsulation at all. (Seven miles of water is pretty good shielding!). I think however, that it is essential to bury it deep enough to try and ensure it doesn’t get scraped off and get left behind with the sediments as the slab descends. I think that SYNROCK (see my post above @3:16) is probably a better option than borosicilcate glass for encapsulation as it is much less prone to the development of microfractures due to thermal and radioactive stress over time. There is PLENTY of evidence that radiation hormesis exists, that organisms benefit from low levels of background radiation, and we GAIN cancer protection by such exposure. No one is surprised that low level doses of UV light protect you from high level doses. Many harmful substances act in this fashion. Why should ionizing radiation by any different? It could well be that by trying to cut all harmful elements in the environment to 0, the EPA is actually doing harm. It may well be that a certainly background level of harmful elements helps us maintain an “immunity” to larger doses. The simple solution is to reprocess the ‘spent’ fuel, still containing more than 90% of the potential energy it began with, and put the unburned fraction and the fissile and fertile nuclides back through the cycle, as well as using ‘breeder cycles’. That way, and bringing thorium into the process, there is enough fuel for millions of years. All that is needed is the political will. Save fossil fuels for industrial, and petrochemical processing. The small amounts of ‘waste’ from reprocessing are not a problem, except to idiots and politicians, but then I repeat myself. From my very rudimentary understanding of the subject, liquid salt thorium breeder reactors are the solution. We need to be developing this technology now. They are eminently safer and more compact than a water cooled reactors. We need to do everything we can to push our government to this solution. Why it’s not being done now is a mystery to me. That is exactly the business plan of Copenhagen Atomics that starts out with waste burner. Here is the company’s white paper on using the thorium breeding process as a wasteburner on present nuclear sites. It makes all the other disposable options obsolete. Thorium has just as many gotchas plus one extra. We dont yet have the experience. It is irresponsible to peddle LFTR as a panacea – its nothing of the sort. It has its own problems. Thorcon is presently developing a thorium molten salt reactor (MSR) with the support of Indonesia. This reactor if I understand correctly is a fast spectrum reactor that can burn up most of the long half-life actinides during an 8 year fuel cycle. The molten salt has to be topped up with some enriched uranium or plutonium during the process and the graphite moderator in the reactor pot has to be refurbished every 4 y. Thorcon has a shipyard process for automating its reactors and believes it can bring reactor build time down to as little as 2 y from the present 15 – 40 y and costs down to as little as $0.03-0.05 / kWh should overzealous regulations allow. The system can also be a source of high temperature industrial heat for processes like petrochemical cracking and desalinization. Another interesting MSR is the Moltex design that has that classic British ingenuity keeping the fissionable material as a molten salt within reactor rods surrounded by a molten nonradioactive coolant salt. Terrestrial energy is also working with small MSRs in Canada and the US and is looking to get a license for a demonstration reactor in the near future. Look these up on UTube or at their websites for more information. That’s always an excuse I hear on not pursuing LFTR. It would equate to ‘not going to engineering school because I don’t know anything about engineering’. You let private sector investments develop this and get the experience. I seem to remember Pres. Bill Clinton giving a speech on why he didn’t want to allow more drilling in Alaska (ANWAR?). He stated that it would take 10 years to start anything flowing from there, we needed answers now. So by not letting the oil companies drill WHILE other solutions to higher energy prices were pursued, the oil and gas just sits there. 10 years later, we could have started to use the oil/gas from there to reduce our energy dependency. Making excuses, not solutions.. Skip to the 3:30 mark for my reference. US LWR are very compact (e.g., fit in the hull of a submarine) and have a perfect safety record. By the way, good article, Roger. The guy in the caption with the bundle may have been handling an empty bundle–no fuel–or he would have been in violation of radiation protection practices. He would have radiation protection, at least by wearing a dosimeter (not seen), and his clothing is too casual. for handling the real stuff, though he does wear gloves to keep the oil from his hands from fouling the bundle. I worked with this stuff and radiation for 50 years and was active in Radiation Protection at a CANDU reactor. The folks taking the pictures usually don’t care about technical details. My favorite is a picture, from the early days of personal computing, showing a guy holding a mouse about six inches above the desk. So what’s wrong with a mouse working six inches above a desk. It’s a trivial lens design issue, and it comes with a distinct advantage. It doesn’t block the room lighting so it doesn’t need its own built in illumination. The first concept for an optical “mouse” used an infinity focused lens, and simply imaged anything in the room. Replacing that with a 1:1 close up lens was an afterthought. But then you need a uniform oblique illumination of the desk surface, and that’s a harder optical problem that the camera lens. I don’t know what the ergonomic police would say about a mouse that runs six inches above the desk. A typical mouse lens has about a 2 mm focal length, so at six inches the magnification would be about 1/75, but you don’t need a sharp image anyhow; in fact you don’t want a sharp image, so you could have a quite useful depth of field. You are wrong, have you ever worked at a new fuel manufacturing plant? My group of engineers, all with commercial nuke plant experience, moved to share our offices at a new fuel manufacturing plant. On our ornamentation tour were shocked by what we thought were lax controls. I was allowed to go anyplace without a dosimeter. Uranium is radiological hazard. QA inspections of completed fuel assemblies is done wearing white gloves and a lab coat. Operators wore dosimetery in case of a criticality accident. An image is worth 1,000 words. Don’t bother with additional words in the caption. It is an unused (not empty) bundle. I have long advocated a floating r.c. caisson, in which the waste is entombed in more concrete; the whole lot sunk in very deep water (itself a very good moderator, of course). My first choice was, and still is, Mariannas Trench (a snoted above). This seems like a good idea to me. Are there any technical objections to deep ocean burial of nuclear waste? Yes. It takes a loooong time for the stuff to get sucked into the bowels, during which you still have the problem of water. Drilling a hole in the seafloor at that depth isn’t easy. Three or more miles of pipe before you even get to the mud. Then again, if you just dump it there, the sea is so big you’d never notice even if it were leaked. That was my next question: Why drill holes in the ocean floor? But you seem to have answered that. The ocean does seem too big to notice even if the containers leaked. Does anyone think this is not the case? It seems to me, that a better disposal site would be a mined out uranium deposit, say in northern Saskatchewan where the richest U-ores in the world are. They could cominute the waste to a fine grain, mix it with millions of tonnes of mine tailings and backfill mined out areas. This makes use of dilution, one of the three parameters defining the strength of the radiation. You could prepare the stopes to seal them as an added precaution. Who knows, maybe the backfill l would capture errant neutrons from low grade wall rock and regenerate the ore (a somewhat different ore). Wow, with re-use/recycle it would become a renooble beloved of enviro-mentalists (sarc). I’m sure we will see further development of using spent fuel as fuel and the problem will be reduced by orders of magnitude. Maybe the design of a depository for waste should make recovery of it easier for such tech. I had thought of something similar. Not because of any technical merits, but because it might play better as a public-relations exercise to be able to say “Look, we’re putting it back into the ground where it came from, which is already a bit radioactive and didn’t harm anybody”. This is the sort of thinking needed because, as we are aware, the real problems in nuclear waste disposal are political and not technical. Returning it whence it came …. a perfect solution! Spent fuel might even contain some Americium 241, Plutonium’s next door neighbor on the Periodic Table, like what’s in that smoke detector on the ceiling of your bedroom. The Canadian shield is a reasonable place to bury radioactive waste. This is one of the oldest, toughest, most stable geological features on the planet, has little seismic activity, and is remote from large populations. Further, parts of it are already radioactive due to naturally occurring minerals. It won’t happen, of course. Politics will prevent it. Yes, it’s not bad but does have the problem of glaciers scraping off several (tens of?) metres of rock every 10,000 years or so. Much better is the Pilbara region in the remote north of Western Australia. Geologically stable for billions of years as evidenced by flat lying strata in iron ore mines there. Use SYNROCK cannisters drilled deep under the old mines. A pretty uninhabited area, great infrastructure already in place to handle the waste…railways, nearby ports, etc. as well as a highly trained workforce and the local geology very well known and understood. Pangea Resources tried to get this going about a decade ago but the greenies put a stop to it (of course). Made me realise they actually do not want to have this problem solved anywhere in the world. They just want bluish-glowing swimming pools to point to as a never ending “toxic legacy” of the reactors. You bury it hundreds of meters deep at least, and perhaps more. Granite is tough stuff. I cannot believe anyone reading this story can still be in favor of nuclear energy. Must be costing a fortune to get rid of the waste. Just stick with gas and coal. The CO2 waste is good for the biosphere: it is like dung in the air…. The point is that waste disposal as an issue is overblown, and there is not an indefinite supply of reasonably priced gas and coal. But there is at least 100 years worth of reasonably priced oil, and 300 – 500 years worth of reasonably priced gas. But yeah, the waste issue was pumped up by the anti-nuke agitators, until they figured out it was gonna be put (safely) in Harry Reid’s state, and they they killed that plan and just quit talking about it altogether. Tom, do you honestly think I was calmed by all the keep away and radiation signs that I saw when I came near to a burial site here [in South Africa]. Is the price of getting rid of the waste calculated in the actual price of the nuclear energy? If so, I would like to see that. I doubt that anyone here knows the real cost of nuclear energy. No more nuclear energy, for me, thanks! heryp, the “standard” risk model, the “linear- no threshold” assumption, almost certainly overstates the real risk of low level radiation by such a degree as to be useless. But people want to be scared, and will fixate on something unfamiliar most of the time, and do things much more hazardous routinely. Frankly if we just took all the worlds waste and stuck it in concrete and steel containers and dropped it in an ocean trench not one single extra death worldwide in the next 10 million years would result. WE are working to absurdly high safety standards that have been clearly shown to be at least 100-1000 times more stringent than necessary. Our exposure to man made radiation from the nuclear power industry is something like 0.1% of all the radiation we are exposed to. perhaps as much as half of all the radiation the US citizen is exposed to comes from medical uses. Each year a US citizen receives more radiation in hospitals than the total level of radiation that is being used as a bench mark for cleanup around Fukushima: That is the Japanese government has committed to reducing radiation to less than that a US citizen gets in a hospital every year. You wanna avoid radiation? Don’t go into a hospital. It is a mr/mrs simple who myopically focus on radioactive waste when billions of tons of tailings and other chemical waste are also accumulating in open air ponds of chemically toxic sludge…etc etc…so what’s up with that then???. Do they have big signs there that say that you must keep away from Cornwall like at the nuclear dumping sites?? nobody will die from a bit of extra CO2. It is good for you. They add it to the greenhouses to 1500 ppm to grow bigger tomatoes…. Most coal plants remove the sulfurous gasses before exhaust to the atmosphere. With methane gas, there is no bad exhaust. No, but Cornwall is a radioactive “hotspot”, more so than at any hospital or power station ANYWHERE! Fractured granite with Radon produced as a decay product from heavier elements leaking up through the cracks. Basements need continuous extraction of the air owing to the molecular weight of the radon being so much greater than nitrogen and oxygen. The cost of disposal is already built into the price of nuclear. In an environment where CO2 is evil, nuclear has legs. In a world where clean energy is needed and CO2 moderation is all you need to do then methane is the way forward. Consider project implementation time 15 years for nuclear 3 years for CC gas stations. Fracking has changed this stuff and economic responsiveness is everything any nuclear station is targeting 2032 to 2042 as a start up. Nuclear has not won the social licence to operate nor has it won the economic war and gas is much better than coal and cost is 5C/KwH in a $6/G world, perfect! It depends whose methane. It is become clear that methane that comes with a koran attached is worse than a stockpile of plutonium. If titanium flasks of waste are buried into the sea floor (under 11km of the sea water protective layer) within few thousand years the waste will be transported into the Earth’s interior. It may not come out to the surface for millions of years if ever. Assuming it does not instead become entrained into the rising plumes of material that wind up creating the island arcs via volcanoes. Islands are about 100 miles away from the trench, at the current estimated rate of subduction it might take between 10 to 15 My to get under the one of the islands. what is the sedimentation rate in that location ?? Subduction rate vary along the trench from about 2 to 6 cm per year. Can you guarantee those canisters will even get down to the bottom though? On the way down there are strong currents etc will they end up in the targeted areas? Yes gas is fine if you have lots of it, until you run out of it, that is. UK converted all coal power stations to gas some years ago, now the UK’s N. Sea gas is running out and has to be imported from Norway. British are in initial stages for construction of a new Hinkley nuclear power station built by French EDF and financed by Chinese. Or it may come out of that little volcano as the subducting slab is melted. Damn it, comment came out at the wrong place – supposed to be under the graphic about four comments above. to countries like China. That worked so very well………Oh wait. The Nuclear Waste Policy Act (NWPA) of 1982, as Amended 1987, dictates that our civilian spent nuclear fuel be disposed in retrievable form in the same geologic repository as the high level nuclear wastes generated from defense production activities. The act, also known as the “screw Nevada bill”, identifies Yucca Mountain as the sole geologic repository for America’s high level nuclear wastes. It has been known for thirty years that it makes no sense whatsoever to be burying our civilian spent nuclear fuel in a geologic repository unless and until we have a clear answer that the reuse or the reprocessing of this SNF is not economically feasible. A hundred years may pass before we have that answer. An honest look at radiation protection science demonstrates that storing SNF on the surface is reasonably safe and reasonably affordable for a hundred years and longer. If the casks start leaking, just repackage the spent fuel for another hundred years, using cask overpacks if necessary. Concerning the nuclear wastes generated from national defense activities, most all of the defense waste which had been previously categorized as High Level has now decayed into a category called Remote Handled Transuranic. There is no scientific reason why the bedded salt of the Salado Formation underlying parts of west Texas and New Mexico, which is the geologic host for the Waste Isolation Pilot Plant (WIPP), couldn’t handle all of our remaining defense wastes. In fact, there is no reason why the Salado Formation couldn’t handle all of our civilian spent nuclear fuel, if we ever decided to dispose of it permanently without the requirement for it being retrievable. A close look at the cost breakdown structure for the Yucca Mountain project reveals clear evidence that burying civilian SNF — material which has the potential for eventually being retrieved — in the same geologic repository as our valueless defense waste massively increases the total lifecycle costs of the geologic repository, and for no real gain in radiation risk mitigation. The nuclear industry’s support for Yucca Mountain and for the NWPA as currently written has played directly into the hands of the anti-nuclear activists. To support the NWPA as it is currently written, and to push for Yucca Mountain as opposed to storing our SNF on the surface in casks, is to embrace the position that spent nuclear fuel represents a serious danger to people and to the environment, something which it most certainly does not. The only possible means the nuclear industry has for moving forward is to address the public’s general fears about nuclear power, doing so as aggressively and as forthrightly as possible, and to stop playing a politics game with the nuclear waste issue, a game which the industry can only lose. If the Republicans in Congress and in the Executive Branch are true to their professed commitment to reducing government waste, they will revise the Nuclear Waste Policy Act to allow interim storage of civilian spent nuclear fuel on the surface, using a consent-based siting process, and they will abandon the massive boondoggle that is the Yucca Mountain project in favor of a rational and cost effective waste management approach. It if far more dangerous and expensive to store SNF in temporary storage than to ship it to the Yucca depository that is already mandated and extremely safe. Look at the thoroughly tested pragmatic engineering we have already invested. Not using Yucca is pure scare mongering politics that harms “We the People”. these reactors produced approximately 6800 tons of spent fuel that year. If collected on a U.S. football field, the fuel assemblies used to fuel all of these reactors for one year would fill a volume 1.3 m high (in contrast, the corresponding height of the billion-ton pile of coal would be 230 km). Harry Reid has alot to answer to for scaring the people away from a sound well researched solution. If EVERY BIT of the electricity that I use during my entire lifetime were produced by nuclear power (by the same type of nuclear reactors that are running today), the entire amount of nuclear “waste” that would be produced to generate this electricity (i.e., the stuff that would be buried in Yucca Mountain) would fit inside a 12-ounce soda can. A wise man doesn’t let the perfect be the enemy of the good. I find none of your arguments against Yucca Mountain convincing. Let’s just get the thing licensed and built and be done with it. When (not if) it becomes sensible to burn the Pu, the U-238, and the other actinides in this nuclear “waste,” then it’ll be easy enough to pull the stuff out of the mountain — as long as it is carefully cataloged when it goes in. That is a gross oversimplification…..there trillions of tons of chemical tailings and other chemical waste other than the end product….spent fuel……take a look at the big picture, starting from ore in the ground..
You seem to be unaware that all of us live in an ocean of radiation — on average, roughly 200 milliRem annually per person from natural and man-made sources. Furthermore, the human species and all other life on earth evolved in an ocean of natural background radiation. For millions of years, Mother Nature herself has been leaching fissionable radioactive U-235 out of the granite rock underlying the Rocky Mountains, with the result that the groundwater systems underlying large areas of Wyoming, Utah, and Colorado are now contaminated with millions of kilograms of radioactive uranium. Mike, do you think it might be necessary to evacuate the states of Wyoming, Utah, and Colorado until the risks of what Mother Nature has been doing for the last several hundred million years can be fully mitigated? And what suggestions do you have for how we might go about convincing Mother Nature to stop leaching all this radioactive U-235 out of our Rocky Mountain granite? Both of these comments make the assumption that using a deep geologic repository for purposes of interim retrievable SNF storage isn’t much more expensive than storing it above ground on the surface. That assumption couldn’t be further from the truth. Managing a deep-reach underground mining operation as a fully licensed nuclear operations facility is greatly more expensive than managing an equivalent surface facility. The cost differential between Yucca Mountain and an equivalent surface facility is even larger because Yucca’s host rock is far from being the optimum geologic media for handling long-term millennial storage requirements, if a decision were to be made fifty or a hundred years from now to leave the SNF in the ground permanently. The poor quality of YM’s volcanic tuff host rock in comparison with bedded salt is directly reflected in the additional money which must be spent to make Yucca a geologically safe repository in comparison to a repository which might be located somewhere in the Salado Formation. David L. Hagan’s argument is further flawed in his claim that interim SNF storage on the surface carries significantly greater risks than does interim deep geologic storage. The NRC’s waste confidence rule says something different. The little bit of extra risk reduction gained by putting the SNF casks in deep geologic interim storage simply isn’t worth the huge cost differential between surface and underground methods for managing our interim SNF storage requirements. Concerning our defense wastes, the great bulk of America’s large volume of valueless defense nuclear wastes has now decayed into RH-TRU. Yucca Mountain isn’t needed to handle that material. It can go to WIPP in New Mexico and be permanently entombed in the Salado Formation much more cost effectively than it could be in Yucca Mountain. Concerning our civilian spent nuclear fuel, managing civilian SNF on the surface for purposes of interim retrievable storage simply does not carry the kind of risks that demand it be placed underground in a deep geologic repository. Yucca Mountain has all the characteristics of a true boondoggle. It is a project being pursued in spite of the fact that many if not most of its driving requirements are faulty or unjustified, and that more cost effective means are already available to handle those remaining requirements which actually do have sound justification. The useful concept of comparing spent fuel radioactivity with that of the original uranium ore, needs better definition of the grade of uranium ore. The large Ranger deposits in Australia were about 0.25% U3O8, while patches of higher grades exceeding 25% U3O8 were mined in some Canadian deposits like MacArthur River, whose proven reserves are given on Wiki as an average of 15.7% U3O8. 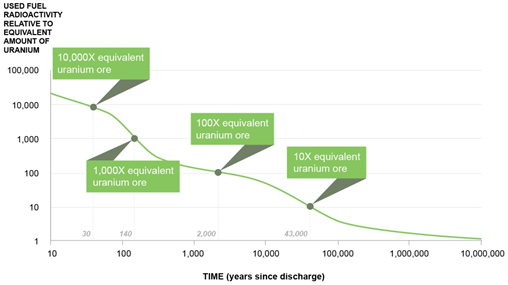 This 100-fold range from 0.25 to 25% in uranium ore translates to the used fuel being stored for somewhere between 100 and 10,000 years, as read from the graph above. This is a large range, with vastly different consequences for management. This essay by Roger Graves is useful overall, but could be tightened in ways like clarifying ore grades. Indeed, for pragmatic people, there is no danger from a scheme whereby all of the used fuel from all reactors to date is simply parked at the surface of a remote place where people are kept at least a mile away at all times. Several of the concepts that Roger discusses are merely following current trends about disposal, but these trends have evolved in a climate of trying to satisfy ridiculous demands by determined activists who can make such demands with no more effort than a thought bubble. It is by this flawed path that we reach the billions of dollars now attached to the Yucca Mountain feasability study. It was time, long ago, to do a clean sheet study of disposal, throwing out the baggage and clichés that have grown up around disposal literature and thinking. As Roger shows, and given that we mine ores safely, the spent fuel is relatively benign after a decade of cooling under water and it should not attract wild schemes like rockets into the sun. It is a simple engineering exercise in which the parameters are well known and easy to manage by conventional engineering – if given a chance. We are seeing another example of science being corrupted by emotional claptrap. That, sadly, seems to be the fate of many concepts that get contaminated by the pursuit of what is called ” climate change”. In reality, spent nuclear fuel management is far distant from climate change and should be relocated to stress this. All the U.S. nuclear plants that have run out of fuel pool storage space are currently storing spent fuel above ground in dry casks. Works well, and doesn’t seem to raise many eyebrows. I spent 30 years (1966-1996) in and around nuclear power plants, so have a pro-nuclear power bias. There’s an abundance of nuclear raw material on earth which doesn’t have any use except weapons and power generation. We should use it before we use fossil fuels which have many commercial uses beyond power production, and are in shorter supply. However, the Chicken Licken, the sky is falling bunch and public scientific illiteracy combine to make expansion of nuclear power near-impossible in the U.S.A. and much of the world. People accept traffic deaths, etc., because they think they’re in control, or something. Nuclear power has been one of the safest industries on earth, but too many people consider it extremely dangerous. I’ve always considered hgh level waste disposal a political problem, not a scientific one. It’s still reprocessed in a couple of countries, and there was limited reprocessing in the U.S. until Pres. Carter stopped it. Between public fear of all things nuclear and radioactive, and the sky-high cost of building nuclear plants, there’s not much hope for a rebirth of nuclear power, no matter how safe. At this late point of the discussion your points are moot. Try answering the objections we raised earlier person by person. Uranium ore can be more radioactive than uranium itself. Read about a discovery of radium. It is like looking at amateurs focusing on the CO2 and ignoring the other chemicals like sulphuric acid and so on…..most of the posts here are myopically fixated on radioactivity and completely fail to address, the big picture chemical waste..tailings and so on that occur in this extremely toxic industry. Toxic chemicals can be and are, safely dealt with every day. No mention of injecting nuclear waste into a subduction zone? I’m not sure why he called it “crackpot” though. Because it is crackpot. In terms of energy potential, ‘spent’ nuclear fuel (waste) is, gram for gram, worth more than gold. the answer it to keep it close to where you can access it when we smarten up more than we are, and reprocess it to get at the unburned energy. Work it out for yourself. It’s not too hard. As justher2013 said it would be a total waste to depose of nuclear waste because it is not waste at all. It is fuel that can be burned in a fast spectrum reactor in the future. We need to keep it where we can get to it. The technology to reprocess spent waste from U fission to retrieve 238U has already existed for half a century. It’s messy and expensive to handle, humming with fission product radioactivity. There’s so much 238U in the earth, quite easily accessible, so what’s the point? But granted, store it for a century and handling would become far cheaper. Agree, just store the current “waste” for future use many generations form now when it makes sense. This may just be me but I don’t like the idea of putting nuclear waste out of reach. What if we discover that there is some isotope that proves particularly valuable some day. Most of the objections to nuke waste were raised before technology reached its current level. The U-238, which is well over 90% of the “waste,” will be a valuable isotope some day. We already have the technology to use it. This technology can be improved, but we still have plenty of U-235, so there is not much economic incentive to develop this technology at this moment in time. My understanding is that a spent nuclear fuel rod is basically ready for re-use after merely sitting cool for 300 years, just pop out the fuel pellets, reassemble into fuel rods and load into a breader reactor. Mild correction here – when uranium or plutonium (any isotope) capture a neutron, they simply become a different isotope of the same element. Subsequent beta decay is what creates a different element in the actinide series (which uranium and plutonium belong to in the first place). Plutonium is already a transuranic element in any case. Some are quite useful, regardless, like americium – which can be chemically extracted. Picky, I know – but accuracy is a need, especially in contentious subjects like this. One should be careful when simplifying to not introduce inaccuracy. Minor error: gamma rays are NOT protons, they are “photons in the highest observed range of photon energy.” (Wikipedia) As far as I am aware there is no type of radioactivity involving protons, other than the two bound to two neutrons in an alpha particle. I also have “An idiots Brief Guide to The Discovery and Uses of Radiation.” Also on Amazon, and cheap at $10, for those few intellectually challenged commenters on this site who haven’t got a clue about radiation. It also has a section on Health Effects of Radiation, and about the LNT hypothesis, for those with a lot more nouse (if you know that word). A Global Guide to Nuclear Weapons Production and Its Health and Environmental Effects”…. A device which enables the user of a computer to direct the cursor around the screen by means of nose movements. Waste from conventional nuclear power plant is fuel for for a fast neutron reactor and the true waste is only dangerous for 300~500 years. The US developed an ‘integral’ transuranic waste burning fast reactor, with a walk away safe unpressurized reactor vessel. The fuel was reprocessed by simple electrowinning on site, and re-used, whilst the fission products were removed and made into an inert alloy. The fuel had no proliferation potential. Very high burnups were possible – 10% or more (they found a simple cure for the expanding metal fuel problem).. The reactor was walk away safe, and could ride out complete abrupt auxilliary power failure. Fission products decay in around 500 years, not a long time compared to the 200k+ years for problematic transuranics (all burned as fuel). Mr John Kerry pulled funding under Clinton. Fast-neutron reactors: A wiser solution to spent nuclear fuel? The cost of deep geological disposal is staggering. It should be included when pricing up thermal nuclear plants IMO. If you want someone to read your essay, Roger Graves has just shown how it is done. This book cover the LNT model quite well. No mention anywhere about the volume of low-level radioactive waste from artificial isotopes used in medicine, and high-level waste from isotopes used as neutron sources in oil well logging, “X-raying” of steel structures to look at the integrity of welds, etc. etc. And let’s not forget the smoke detectors that all of us should have in our homes IIRC they contain a few micrograms of 241Am, but there are lots and lots of them. None of these have anything to do with nuclear power, but they all generate radioactive waste. Many of us are old enough to remember watches with luminous “radium” dials. I still have an altimeter from a P51 Mustang. It has a “radium” dial with really big figures, and when I started working in uranium exploration and had a scintillometer, I realised how very radioactive it was, and it had better be stored outdoors. Some of us remember gas lighting in houses. The gas “mantles” are made of thorium oxide, and they were quite strongly radioactive. Not many houses with gas lighting any more, but you still have mantles in Coleman lamps and Tilley lamps and Primus lamps. Somewhere between 1970 and 1990, they manged to produce refined, non-radioactive ThO2. My point is, as an advanced industrial society, we use a shed-load of radioactive isotopes for all kinds of things, and I’ve probably only mentioned a fraction of them. They all have to be disposed of, but do we hear a whimper from the green set about their dangers? They do not HAVE to be disposed of. We live every day and every night of our allocated 24/7 in the presence of natural radioactivity. Natural radioactivity is just as harmful as that created with the help of mankind. It is a fair assumption that radioactivity needs to be managed only when it adds an extra, largish burden to the natural amount. Thus, if one spread that Mustang dial over a large enough area, it would not be detectable above the natural background and so would not need management. However, before it was spread, it could be a “point source” type of danger, depending on the weight of radium used. But this is all old knowledge and routine procedures today have learned from the observations of old. You point to a difficulty that others have also mentioned before. That is a success story producing problems of the unintended consequences type. The early instruments for detecting radioactivity were too sensitive, they were too successful. They were also fairly easy for the public to access and use. Over the decades, all sorts of materials, like bananas for instance, were found to be anomalous in radioactivity. While this type of information was probably already known to science, or could be predicted, it made a talking point that like all talking points, had the capacity to be distorted and used for anti- nuclear propaganda. If the early Geiger counters had not been so damned sensitive, we could have avoided a huge quantity of misinformation, be it accidental or by design. Most radioactive medical waste has very short half-lives — minutes, hours or days. After 10 half lives in many cases it is no longer considered radioactive. Some are such low level that they can be disposed of down the drain — disposal by dilution. It used to be that there were no regulations on radioactive human waste — just throw it out, flush it or burn it. No more. In my lab we were able to dispose of radioactive reagents by letting them evaporate under a fume hood — disposal by dilution — but the reagent vapors were considered chemical pollutants so we had to let them sit for 10 half lives then treat them as chemical waste. Radioactive research animals were double bagged, sealed in yellow 55 gallon steel drums and trucked to Hanford. There are many interesting stories in nuclear medicine. Not all of them are funny. Yes you do here a lot about the dangers of that stuff, if you listen in the right place. Ex RAF bases may have sites with substantial contamination from exactly the type of dial you describe. I’ll add one more use of nuclear material – a common UK telephone model, the ‘trimphone’ had a luminous dial surround provided I believe by radioactive tritium. Luminous dials have a longer history of contaminating humans. In WW1 dials of military aircraft were painted with a luminous paint based on alpha activity of 226Ra. Only a few years later cases of osteosarcoma began to appear among the “dial painters”, but several more years would pass before radioactive substances like radium – initially even considered as a health tonic – were recognised as carcinogenic. Now the dial painters like WW1 veterans have only just died out. They represent still the best source of epidemiological data on bone carcinogenesis from alpha emitting bone-seeking radionuclides. They show very clearly a threshold: 10 Gray of cumulative dose to the endosteal bone lining cells. Only above 10 Gy did osteosarcoma start to go into excess. Interestingly leukaemia was completely absent as an elevated risk. The dose distribution was wrong – the haemopoietic stem cells associated with leukemogenesis are deep on the central marrow spaces, while the short (20-30 micron) ranges of alpha particles failed to reach them, damaging instead the peripheral bone lining cells and causing osteosarcoma. This is one of many lines of radiobiological evidence that firmly refutes the LNT linear no threshold hypothesis of radiation carcinogenesis. There are plenty of places on earth where above ground storage is very feasible. In the U.S. for example, Skull Valley, Utah comes to mind. The only real problem would be security, what with all the nut job radicals who’d like to get a hold of the waste for dirty bombs. Would the container suffer corrosion of dissimilar metals? Don’t feel competent to make an informed decision on nuclear but have seen a nuclear bubble come and go. 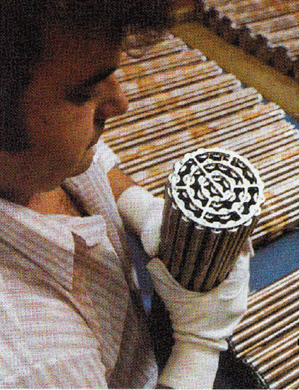 Mid to late 1970’s TVA undertook a very large scale nuclear electricity generation program. Billions in bonds were sold and construction was begun at several sites. Rapidly increasing electricity bills were a concern for all consumers but not sure that nuclear was the reason. The massive capital investment raised average wages in our area and resulted in the Dairy Queen becoming the Nuclear Drive In. After a few years of construction many of the sites were abandoned and coal plants were expanded or built. Apparently demand did not meet projections. The debt remained and may actually still be getting paid by the usual victims i.e. ratepayers. Who knows what really happened? The Dairy Queen is back but sits in the shadow of a gigantic containment tower with no reactor under it. Pure farce. I recall the fear perpetuated by the British media in 1984 regarding nuclear waste, so this test was set up. The locomotive weighs about 110 tons and each of the cars about 10 tons each, and I think the speed at impact was about 100 mph. Interesting article which suggests that solar energy production employes more people than coal, gas and oil combined. There may be posters who are very unhappy at this and think it a waste of resources, but that employment is a lot of votes. Nuclear production employs 68,000 and solar 373,000. I suppose one of the reasons is that local engineers can install solar power on your rooftop with great success, but nuclear takes a bit more skill. Fossil fuel employs 187,000, wind generation employs 101, 000. These are US figures by the way, so the difference in Europe would be even more stark. That’s Govn’t for ya. Employ people to dig holes, quickly followed by more people to fill them in again. Works every time, until it doesn’t when OPM runs out. “Interesting articles” rarely “suggest”. For hard science, articles of interest produce hard figures and hard deductions consistent with the data gathered. The number of votes from readers is immaterial. I am one of those who considers make-work projects to be not needed, not wanted and a drain on more productive work. Since I was first involved in the costing of national electricity systems in the 1970s, it has been well known that large scale solar and wind would never compete with fossil fuel electricity for other than small boutique applications. Part of the reason was the more numerous labour force per useful MW produced, part was because of energy density limitations, other reasons also. It is sad to have to pay so much money for wind and solar to show that the 1970s figures, especially their relativity over different generation types, has remained fundamentally the same. How much more money will be wasted to prove the busted flush predicted in the 1970s? You may not have noticed that Nuclear power is also heavily subsidised. as are most energy sources.Is that ok as long as the source is not renewable? The grammar used in my post is typical of the way studies are addressed in the UK. We don’r say “this research says this or that”, we say “This study suggests that” this is because we don’t believe any science or research is “case closed and science settled” though I accept you may feel that way against energy sources you fundamentally disagree with. Any tax rate less than 100% is a subsidy. Every electrician who once in a while screws a panel onto a roof is part of the 373 000; his wife, who does the book-keeping every friday, too. That is how “clean-energy” jobs are created all over the world. Gareth, I am taking your numbers for granted. EIA data (USA, January 2017) bundles wind and solar as “other renewables”. 474,000 jobs in wind+solar generated 29.4 TWh of electricity. 68,000 jobs in nuclear generated 73.1 TWh. 187,000 jobs in fossil fuels generated 203.4 TWh. Please compare the efficiency of these jobs. Could we please, please dispose of the notion that power reactors and reprocessing are a weapons proliferation risk? Any government wanting nuclear weapons will get them regardless of a civilian power program or not. Look up how Stalin got the plutonium for his first bomb. Leave the rods in the reactor too long and you have a nasty isotope separation problem. Pu 239 and Pu 240 are more difficult than U235 and U 238. Look at the differences in atomic mass. Well, originally, that is exactly what the reactors were built for. Making weapons grade fissile material. Much UK nuclear plant set up with that in mind. Speaking from a rather ignorant position, may I ask why it is that we assume categorically that future societies will be ignorant and therefore incapable of dealing with nuclear waste? We assume that it will forever be impossible to use any of this stuff, whatever it may be now or in the future. Also, I always understood that the longer the half life of a radioactive substance the less dangerous it is and the less need to go to extraordinary lengths to isolate it for vast periods when it will be virtually harmless. A common misunderstanding about the half-life of radioactive materials. It’s not that we assume that future societies will be ignorant, it’s that we have to assume that it is a possibility and plan for it. Or we could wrap the nuclear waste in photovoltaic panels tuned to capture the specific wavelength of radiation emitted by the waste, and use the electricity produced to run the floodlights and electric fences keeping the hippies out. High energy photons heck. That’s what solar panels are designed to collect and turn into electricity. Alpha and Beta particles are blocked by water and other solids. Easy to control. It’s the gamma radiation photons that are the bug. Solar panels as nuclear waste containment are the solution with a bonus of extra usable electricity. After the half life is over the light emitting diode winks out, signaling it’s safe for handling. the UK is no nearer getting even a site for this than it was 50 years ago. Is anyone actually building a deep repository? In Finland we have a company called Posiva drilling a repository for HRW. Planning started 1980, drilling is ongoing and its ready 2020. The cost of operation is collected during last decades, the cost is added in the price of electricity produced using Uranium. The whole spent nuclear fuel issue is based on a false assumption. Spent fuel is dangerous for about 300 years. For something to be dangerous, people would be hurt if precautions are not taken. At 300 years radiation from spent fuel would not be hurt people. Water is dangerous. Many drown every year. About 17 liters of water, can result in death if taken in one sitting. There have been cases where this has happened. Eating is dangerous. I once was taking a date out to dinner. We had been dating long enough for me to know her parent were dead but I did not know the details. Going to the steakhouse where her father choked to death was a mistake. Chinese it is! While in China, two of us had food allergies. Not being able to read the menu, was a challenge. Duck it is! The point is we all have experience with loved ones being hurt or killed. My brother in law was killed by a drunk driver. We have all spent anxious hours in the emergency rooms second guessing what we could have done better to keep our children from being hurt. None of the readers here have any experience being hurt by spent nuclear fuel. The question of what to do with spent nuclear is a result of manufactured fear by the anti-nuke lobby. As this essay demonstrates, there are many answers providing good solutions. I’m not an engineer but this is what I’ve gleaned from various sources. When it comes to waste, advantage LFTR. LWR 1 GW Year – 35 tons of spent fuel – 93% unused fuel plus transuranics and fission products. Also 215 tons of depleted uranium left over from enrichment. for Pu-238 does not produce transuranics. Uses thorium (an unwanted waste product from phosphate and rare earth mining) so no mining or enrichment required. Fission products quickly decay to stability. 422 isotopes at shutdown – about 1 ton. 56 isotopes at 1 week. 24 isotopes at 1 year. 17 isotopes at 10 years. 12 isotopes at 100 years. 8 isotopes at 300 years – about 250 Lbs. – listed below. Se-79 Selenium	327 K Yrs. Zr-93 Zirconium	1.5 M Yrs. Tc-99 Technetium	213 K Yrs. Pd-107 Palladium	6.5 M Yrs. Sn-126 Tin	100 K Yrs. I-129 Iodine	15.6 M Yrs. Cs-135 Cesium	2.3 M Yrs. These 8 isotopes are 1 neutron away from stability. So if one had a neutron source, like say a reactor, it might be possible to transmute these to stable isotopes leaving zero long term radioactive waste. A great idea. It should be easy to extract those 8 elements from a spent fuel. There will be probably more than one isotope of each, and an irradiation by neutrons may create new radioactive isotopes. Definitely worth more development. One of the best books on this general subject of the history of radiation, ever written, in my opinion, and I go back it often enough, is the one by Marshall Brucer. A Chronology of Nuclear Medicine. If you follow your burial concept, you are depriving centuries of humans in the future of nuclear power. Why on Earth should we be so inconsiderate? Develop instead safe methods of utilizing all the energy in uranium and thorium so mankind can have a long and productive future, millennia, not just centuries. This means reprocessing and reuse. If man can get to the moon, we sure can find a way to dispose of nuclear wastes — if we have the will to find the means. All the whingeing nay-sayers are probably exposed to more radiation in aggeregate by visitng their basements, flying at high altitude, having x-rays, etc., than ever they would get if one truck passes by, laden with a massive containment vessel containing spent fuel-rods once a year. Anyone got any figures on this? When I first read, many years ago, about the development of the Molten Salt Reactor by Weinberg, I was horrified by the fact it was another of those ‘best of the best’ ideas defeated by our “need” to develop plutonium producing reactors to fuel the war effort. But the fact that it can be net or negative on long-lived radioactive products is a real deal changer. Stupidly, only the Indians and China are developing on a crash basis this USA technology, stand on the shoulders of Weinberg’s crews work. I have heard that the problem in Chernobyl has not yet been resolved. They have to re-encapsulate the whole plant again because the radiation is increasing. Friends, can we leave it there? There is no future in nuclear energy as the safety measures including the disposal of nuclear waste are cost prohibitive. Nothing to do with me being right, left or centre, politically speaking. In [ http://www.world-nuclear.org/information-library/safety-and-security/safety-of-plants/chernobyl-accident.aspx ], the statement ” There is some dispute among experts about the character of this second explosion, but it is likely to have been caused by the production of hydrogen from zirconium-steam reactions.” was a later addition to the discussion. Shortly after the event occurred a discussion I saw (no link) referred to a hydrogen explosion that occurred because of attempts to fight the graphite fire with water. This reference points out that the cooling system rupture provided plenty of water for such a hydrogen promoted explosion which would be necessary to explain the one kilometer high debris ejection. It does not seem likely that a simple hot graphite-heated thermal steam ejection could be provide the immense energy required. Even according to your source, the steam come from ruptured primary and secondary cooling circuits, and the explosions happened within two seconds. I don’t really believe that the Soviet government made a decision within two seconds. Actually, the Chernobyl management maintained for hours that the reactor was intact. There is a readable account of the events by Zhores Medvedev, available at Amazon. henryp. There is nothing else but nuclear as yet after fossil fuels are gone. The number of deaths at nuclear electrical generating plants were fewer than a dozen in 50yrs until Chernobyl which was designed with no safety features by the Soviets. Today, it is now a game park. Early deformed animals were eaten up by healthy wolves and other predators that ultimately came to the “park”. You can google 4000 deaths or more but in reality there were only about 70. Go to Wikipedia – you will trust that re deaths caused by Nuclear electrical plants. Did you know that only one person died in the most nuclear electrified society in the world? France. Some governments are getting the French to design their nuclear plants. Since 1980s when Chernobyl was built, we have had a revolution in electronics, detection and controls. Anyway, rant and rail but there is nothing else so far on the horizon to replace fossil fuels which are not going to last.I’m sure at this late date you are somewhat disappointed in renewables (except for hydro, which you may not like either). This can apparently keep us for ages. 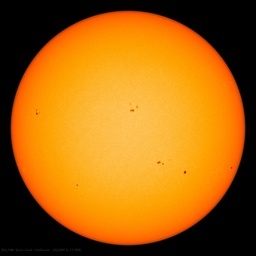 Then we have solar, in various forms but it is lower on my list of importance due to costs as do tidal forces. Last on my list would be nuclear, simply because it is too expensive because of all the [too] apparent risk factors. I don’t know what the half life of an idea is, but in ten years I may not be around. So, I’ll add to the proposals to drop radioactive waste into the salt chuck, as we say on the Wet Coast. Put it in old shipping containers, sheath it in lead and then glass it. For shipping to the Mid-Atlantic rift. It is some 5000 miles long. Drop it. Any threat is gone. A patent medicine called Radithor was touted as a cure for more than 150 maladies. I guess that this reference will drive the chronically superstitious up the wall. but enter the comment confident that such posters do not frequent this site. subtle2 I am an old geezer also and during my life the hype of the dangers of radioactivity have amused me greatly. The ending of ww11 by dropping two dirty atomic bombs on Nagisaki and Hiroshima should have caused by todays standards a thousand years of toxic zones. Strangely the people rebuilt these cities and those close to the blast zone that survived got on with their lives. Recently i saw a little snippet of a woman that lived into her 90ties that was just outside the blast zone in one of these cities. Those that survived seemed to have normal lives. Methinks the hype about exposure to radiation is a little bit exaggerated and exposure to the sun in too much quantity is as dangerous. we have companies and factories dealing with nuclear waste? one person’s s..t is another bread>? one person’s s..t is another person’s bread? I’m surprised no mention of disposal into plunging tectonic plates. An oceanic plate descending below a continental plate seems like the perfect place for high level nuclear waste. It was suggested in the comments, by Mr. Vukcevic. Reprocessing the fuel is probably a better idea. Most fuel only burns 10% before it is done. Pressures in the fuel cladding and growth in the coolant channels is a problem long before lack of fuel. Secondly, why bury it deep? exposure is really a distance squared problem and shielding problem. At 100 feet, not particularly deep, I’m not sure you would be able to detect much. The actinides can be put back in an operating reactor as fuel. One thing to keep in mind is that the ideas for disposal are also meant to deter nuclear power. They pick a time frame longer than recorded history and ask that you guarantee that it will be safe that long. You can’t. You can’t accurately say what is going to happen 500 years from now. Reprocessing is the best option. Deep storage is not a solution at all. One point that I left out of the original post for the sake of brevity, but which on reflection I should have put in, is that the Canadian plan for long-term disposal acknowledges that our knowledge of all things nuclear is far from perfect, and that we might in future find better ways to deal with high-level waste than just burying it. Consequently, the Canadian plan envisages storing all HLW at a central, surface depository for a prolonged period – several decades, probably – before a final decision is taken to bury it. The surface depository would be adjacent to the selected deep burial site to minimise transport costs. If a better method of dealing with HLW is found in that time, burial would presumably not be needed. thx for this post which opened up a debate on preferences for sources of energy. I cannot remember seeing any comment from you except this last one; the suggestion you make seems valid enough, but necessarily would make nuclear energy even more expensive, because of transport costs. It has been years, but I’m pretty sure that Asimov’s books and essays regarding a radioactive Earth becoming hostile to life had nothing at all to do with an accident. Instead, someone came up with a way to have the natural radioactivity of the planet increase with time, instead of decreasing as it does naturally, through manipulation of the physics of nuclear processes. The idea was to make the planet bound population leave or die; because the space faring pioneers had created, in their eyes, a place that does not exist, aka Utopia.